Ottawa – The Recreation eGuide and Mon Cyberguide francophone des loisirs for fall and winter programs are now available online at ottawa.ca. Choose from a wide variety of activities for all ages, including swimming lessons, fitness classes, general-interest courses, sports and instruction in the arts. Registration for swimming lessons and aquafitness classes begins online and by phone (613-580-2588) on Monday, August 13 at 9 pm and in person at City recreation facilities on Tuesday, August 14 during regular business hours. 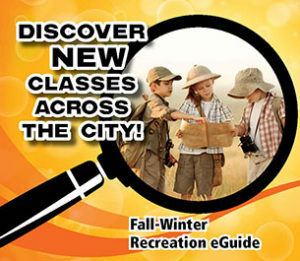 Registration for all other programs begins online and by phone (613-580-2588) on Wednesday, August 15 at 9 pm and in person at City recreation facilities on Thursday, August 16 during regular business hours. Residents who do not have access to the Internet are encouraged to visit City facilities or libraries with public Internet access. They can also visit any Client Service Centre or City facility where customer service staff can help with registration. Some community centres may provide printed brochures for their local activities. For more information on City programs and services, visit ottawa.ca or call 3-1-1 (TTY: 613-580-9656).